Hospitals and clinics, medical supply stores, doctors‘ practices, nursing homes and home care: vital medicines and medical products have to reach patients on time. To ensure this, Fresenius Kabi Logistik GmbH has around 120 vehicles on the road in Germany every day. They transport sensitive products to delivery points, some of which are in the inner city. With PTV Route Optimiser you can plan and schedule optimised routes for your whole fleet - taking into account all restrictions and requirements. Fresenius Kabi acquired the first professional route planning software from the Karlsruhe-based specialists in planning, transport and traffic as far back as 2005. Until then, there was just a rough trip plan which had been developed by the company itself. It covered the entire federal territory and specified which customers in which postcode areas should be visited how often and at what time. „PTV Route Optimiser is an all-rounder,“ says Steffen Redetzky. „Even the planning process can be implemented considerably faster and more conveniently than with our two previous programs.“ The reason: master data management and route planning now both take place in a single system. PTV Route Optimiser calculates both the Fresenius Kabi delivery notes and the return orders into optimal trips. All of the customers’ requirements, such as delivery date, time and access route are taken into account. Furthermore, all urban restrictions such as pedestrian areas, low-emission zones and traffic routing are also factored into the equation. In addition to vehicle capacities and vehicle equipment, the route planning software also takes statutory requirements related to driving time, rest periods and working hours into consideration. For every trip, PTV Route Optimiser creates an automatic loading list. Using this list, the appropriate truck is loaded at the central warehouse in Friedberg, Hesse. Each day, several 40-tonne trucks start from here and drive in a star formation to the individual regions. Their destinations are the Fresenius Kabi branches and distribution bases. Medication and medical products for chronic and critically ill patients are among the goods loaded onto regional trucks and Sprinter vans and delivered directly to customers. PTV Route Optimiser also integrates the toll calculation as well as an individual reporting system, with SQL reporting for dynamic supply control and the system control list. The latter serves the optimisation of small goods in the commissioning process and enables the manual recording of parameters and sorting sequences for the printing of delivery slips, significantly reducing the manual sorting effort for schedulers and drivers. The schedulers report the actual route to the freight forwarding software using the feedback function in PTV Route Optimiser, which then processes the information for the invoice. Fresenius Kabi AG is a globally active health company that offers medicines and medical products for infusion, transfusion and clinical nutrition. The company employs over 33,000 people around the world and achieved a turnover of approximately six billion euros in 2015. 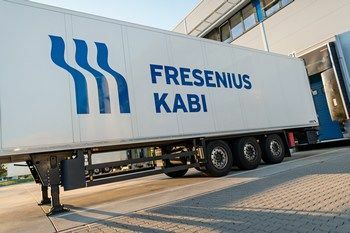 Within the sales organisation in Germany, Fresenius Kabi delivers to its customers largely in its own distribution network – through its own companyoperated vehicles and through a fixed list of transport companies which operate exclusively for Fresenius Kabi. This ensures the service- and quality-oriented fulfilment of the specific customer requirements in the medical and pharmaceutical sector.